The Sorvall Legend RT is a powerful benchtop centrifuge that combines speed and high capacity. With a large selection of rotors available and a maximum capacity of three liters the Sorvall RT Legend Centrifuge is a flexible and robust addition to your lab. This tabletop centrifuge is easy to maintain with its brushless motor and comes equipped with SMART spin auto imbalance detection. The Sorvall Legend RT Centrifuge rotor system is built to handle conical tubes, flasks, falcon tubes, micro-tubes, blood collection tubes, bottles and microplates. When using a fixed angle rotor this benchtop centrifuge tops out at a speed of 15,000 RPM, or when using a swing rotor, the max speed is 3750 RPM. 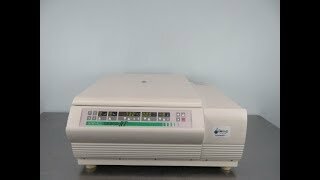 The Thermo Scientific Sorvall Legend RT Refrigerated Centrifuge has user friendly controls, four user programs, and has a temperature range of -9°C to 40°C. All of our centrifuge are tested with NIST traceable tools. Each system goes through a speed test to ensure the instrument is performing to factory specification. This Sorvall Legend T Centrifuge has been fully inspected and is performing to expectations. All of our lab equipment comes backed with our standard warranty. Should you have any questions, please don't hesitate to contact us.